Batch Document Converter Pro is for batch converting documents automatically to pdf in the document sequence of your choice, documents formats that are supported are: word doc, docx, docm, xls, xlsx, xlsm, rtf, jpeg, png, gif, tiff, emf, wmf, bmp, psd, dwg, dxf, mht, txt, html, aspx, php, pdf, log, pst, ost, msg, eml, ppt, pptx & lst. For maximum quality, preservation, robustness & speed these formats are converted to pdf and are NOT printed to pdf like other products. 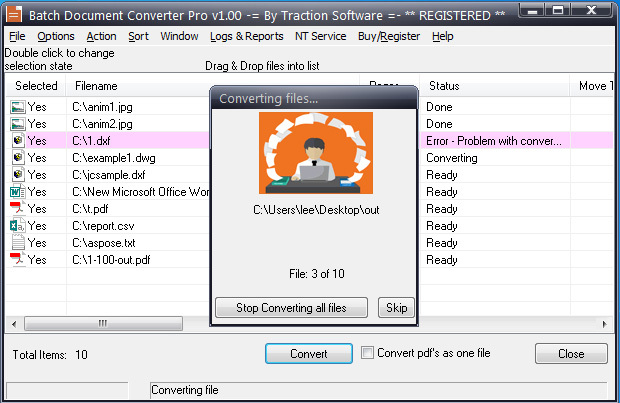 Batch Document Converter Pro software features include Directory monitoring, FTP monitoring - secure FTP (SFTP) & POP3 Email monitoring with SSL & TLS support, Scheduler, Optional PDF Appending into one file for convert, PDF Portfolio file support, internal PDF page range conversion, drag & drop of files for ease of use, save, load, append batch lists for later use, list ordering options, refresh lists to pickup new files, separator page generation between each file options, batch file replication, DOS & VBS scripts within list, zip, rar & 7z file support - automatically extracts the archived files and converts them, logging & reporting, email notifications, can run as an NT service with optional network logging for status, full command line support, quick job setup for converting lists of files quickly by task name, pdf color/bw splitting option to different conversion setups/different conversion output folders + lots more features. 160mb of disk space for installation. Can use more memory when converting files, i.e. the size of the files.